Trained as a woodworker and with a 20-year career as an interior designer, Dan Ohlmann created his first collection of miniature furniture in 1985. Driven by his passion for the Art Nouveau style, he created a 1:12 scale model of the interior of the famous restaurant Maxim’s de Paris in 1987. This ultra-realistic piece, a combination of artistic performance and architectural skill, wowed in France. Having moved to Paris just two years earlier, the miniaturist was suddenly the focus of intense media attention. His work had never appeared in the press before, but to his great surprise, it was now the subject of articles in magazines like Le Nouvel Observateur and Le Figaro. Television programmes like Champs Elysées, Tous à la Une, and Nulle Part Ailleurs invited him as a guest. He soon realised that he had been fortunate enough to be the first miniaturist ‘discovered’ in France. At the same time, Dan Ohlmann was working as the artistic organiser and co-founder of the first International Miniatures Festival, which welcomed 25,000 visitors over 5 days. He also launched his own travelling exhibition entitled ‘The Miniatures of Dan Ohlmann’, presented in a series of cities in France and elsewhere in Europe, and even several times in Japan. His work was also exhibited in the United States with help from the French Heritage Society (formerly known as the Friends of Vieilles Maisons Françaises) as part of a tour arranged in 1986 under the patronage of the French Ministry of Culture. Dan Ohlmann’s three lorries full of miniatures arrived in Lyon for a 2-week exhibition on the famous Place Saint-Jean. He instantly fell in love with the city and decided to leave Paris behind. 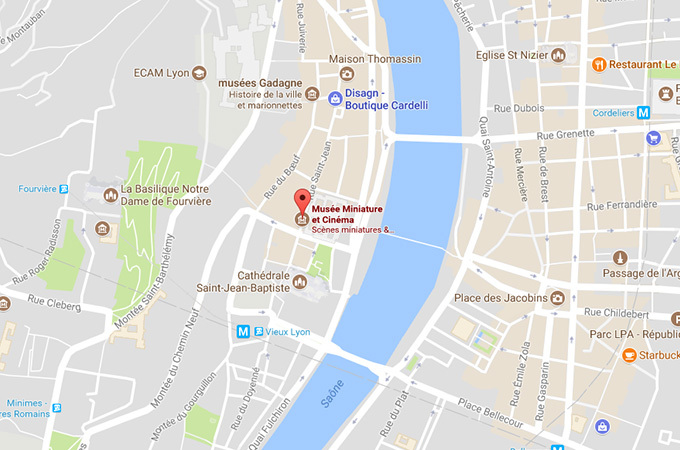 He soon founded his first little museum in Vieux-Lyon: the Palais de la Miniature. He spent his days in the studio, creating new miniature scenes to expand his collection. Over the next 10 years, the Palais de la Miniature gathered more than 1000 tiny masterpieces by artists from all around the world, quickly becoming an unusual attraction that was greatly appreciated and strongly supported by the people of Lyon. Dan Ohlmann organised occasional temporary exhibits on a topic he has always found fascinating: special effects modellers in the film industry. In 2000, in response to an attractive offer in Paris, he agreed to the Grévin group’s proposal to temporarily display a large collection of miniaturised scenes at France Miniature. Fascinated by his work, a Swiss collector who was well known around the world for her passion for miniatures and cinema offered Dan Ohlmann her help in transforming his small family-run museum into a world-class attraction. His new patron was so passionate about the arts that she offered to help him move the museum to a large building in Lyon dating back to the 16th century, the ‘Maison des Avocats’, which she then purchased. In February 2005, all of Dan Ohlmann’s works were moved to the museum building, which is listed as a UNESCO World Heritage Site. The pieces were soon joined by the works of dozens of other miniaturists, along with a permanent collection dedicated to another of his passions, the arts and techniques of special effects in films. Dan Ohlmann would like to thank everyone who has helped him to enjoy this wonderful adventure for over 25 years: the Swiss collector who helped expand his museum, the media outlets (radio, television and magazines) that have supported him along the way, the collaborators who have worked by his side for more than 12 years, his many friends at film studios and in the world of miniature art, and the members of his family, without whom none of this would have been possible.